You may return most new, unopened items within 30 days of delivery for a full refund. We'll also pay the return shipping costs if the return is a result of our error (you received an incorrect or defective item, etc.). If you simply have buyer's remorse, or decide on another product instead, or ordered a product in error, you will be responsible for return shipping. All UPS® and Fed Ex® items will not be charged a restocking fee, however on large freight items, a restocking fee of up to 25% will apply. Returns will not be accepted after 30 days, and will not be accepted on used or installed items without original packaging. We can ship to virtually any address in the continental U.S.(lower 48 states). All truck freight is delivered curbside. White glove delivery services are available at additional costs and must be agreed upon prior to shipping. Some items are small enough to go Fed Ex® ground, or UPS® ground, when that is the case you will receive valid tracking for standard ground shipping(3-5 business days. Contact us for expedited shipping services. Expedited shipping will have additional costs. Most of the items in our E Commerce store are freight items (meaning they are large items that need to be delivered on a pallet, on a truck load). When you order an item that is shipping via freight, we will upload appropriate tracking number along with carrier name. If you have specified a residential delivery, all freight carriers will call and schedule a delivery appointment. When receiving your freight order, inspecting the pallet is important to ensure there is no damage. Please see video below for detailed instructions on accepting freight orders. Which takes less then 5 minutes. Freight damage is rare, but occasionally does happen. 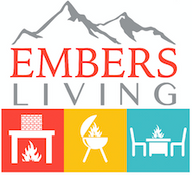 (please note freight carriers do not directly represent Embers Fireplaces & Outdoor Living). Please inspect upon delivery. If the delivery appears to be damaged call our office number. 805-952-5440 before the driver leaves in case we need to refuse the shipment. Please note any damage on the driver’s BOL. If an order seems damaged beyond repair when receiving, please refuse entire shipment due to damage, and a new order will be sent in its place. You will also need to make sure no items are missing. Please open and inspect the shipment and report any concealed damage or missing items within 24 hours so we can get it taken care of for you asap.